Governor Charlie Baker in his office at the Massachusetts State House. For Democrats, the numbers are grimly unyielding. And in a state that leans left, it’s something of a political puzzle. For more than two years, about 70 percent of voters have approved of Governor Charlie Baker’s job performance — an unwavering level of support unseen at the State House in a quarter-century. The persistent backing for the Republican is keeping top challengers away, smothering the fund-raising efforts of the candidates already in the race, and dimming the prospects of Democrats retaking the corner office next year. But behind those numbers and headlines about the nation’s most popular governor is a more complex picture — and perhaps a glimmer of hope for Democrats. Scores of interviews with residents, pollsters, Baker aides, Democratic operatives, and outside political observers paint a picture of a governor who is neither beloved nor detested; a man who is not shaping the political zeitgeist but is in harmony with a key part of it; a pol who is neither too hot nor too cold on key issues of the day. 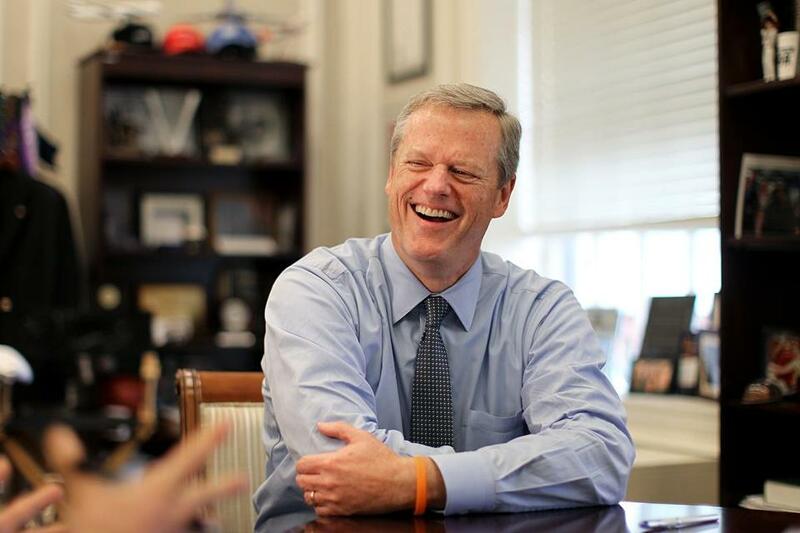 For now, at least for many of the state’s residents, Baker is the Goldilocks governor: just right. His wonky, straightforward style stands in stark contrast to that of his party’s bombastic leader, President Trump. What’s more, Massachusetts’ economy is strong, and unemployment is low; there’s a sense among voters that the state is generally headed in the right direction, while the nation is on the wrong track; Baker has crafted a likable media persona; he’s presented himself as a fiscal check on the Democratic Legislature; and there’s been an apparent dearth of crises in state government. Some Democratic operatives say Baker’s popularity stems in large part from the Republican avoiding a bold policy vision, from not taking any big controversial swings and thus avoiding any big, damaging misses. But if that’s true, people pushing carts through the parking lot of an Everett shopping plaza on a recent morning didn’t seem to mind. “I like him. He’s good for the economy,” said Pat Woods, a 67-year-old Malden resident and registered Democrat outside a Target store. Kelly Lynema considers herself liberal. She’s not registered with either party, and cast her ballot for Baker. Now, “I’m fairly neutral on him,” the Medford 40-year-old said. Asked if she regrets her vote, Lynema paused to ponder the question. “No,” she said, emphasizing the difference between state and federal politics. Baker’s plum position is all the more striking because he defeated Democrat Martha Coakley in 2014 by the smallest Massachusetts gubernatorial margin of victory in 50 years. Since then, he has benefited from several factors. The economy is strong in parts of the state, with unemployment at 4.2 percent statewide. While people feel the country is heading in the wrong direction, the feeling about the state is flipped. Baker has hewn a careful path speaking out against the president. The governor has crafted his criticism in muted tones of disappointment that emphasize where White House policies would hurt Massachusetts, and he’s done so without catapulting himself into the national spotlight. Almost all of the state’s highest-profile Democrats — Boston Mayor Martin J. Walsh, US Senator Edward J. Markey, Attorney General Maura T. Healey, House Speaker Robert A. DeLeo, and Senate President Stanley C. Rosenberg — have played nice with Baker, emphasizing their policy agreements and eschewing the partisan sniping common in states with members of both parties in top posts. While the governor does not possess the high-charisma public speaking skills of his Democratic predecessor, Deval Patrick, Baker aides say he has managed to convey to his nearly 7 million constituents an image not just of wonky competence, but also of someone who has a big heart. They point to the governor getting his head shaved for charity three times, taking the ALS Ice Bucket Challenge wearing a “Free Brady” T-shirt, and frequently talking about the state’s opioid crisis. They think those actions have broken through to voters. Some Democratic insiders say the governor’s high poll numbers come from playing small ball — pursuing modest, incremental tweaks rather than sweeping change. And, they argue, Baker’s schtick will wear thin just as soon as voters have a choice between him and someone else. But many are less sanguine about the chances of the three Democrats running for governor, Newton Mayor Setti Warren, former Deval Patrick budget chief Jay Gonzalez, and environmentalist and entrepreneur Robert K. Massie. Baker, they say, fits the moment. “We have to provide a contrast, but when people are happy that’s hard to do,” said Democratic consultant Scott Ferson. In an interview, the governor attributed his popularity to several factors, including his emphasis on bipartisanship, the high caliber of the people on his policy team, and his administration not getting “tangled up” in partisan noise. He pointed to progress at Massachusetts’ prison for men with mental illness, at the Department of Children and Families, in bringing high-speed Internet service to rural communities, and in other areas. “The number of people who feel strongly about him is extremely low,” he said, and that should be a cause for GOP concern because once a campaign starts in earnest, those voters are likely to quickly peel away from the governor. Crawford, who has worked for several Baker antagonists, including an MBTA workers union, the state Democratic Party, and teachers unions, argued that the governor has enjoyed an extended period of blaming others for the state’s problems, artificially buoying his job approval.